Aquaplaning or Hydroplaning is one unseen enemy on the road that takes away the control of a car from you and may cause a fatal accident. It happens when a layer of water builds between the road and the tyre that leads to loss of traction. Vehicles stop responding to control inputs after aquaplaning and slides around uncontrollably. The water mixed with oil and dirt acts as a lubricant and does not let the tyre grip the road surface. It happens only when all the four tyres are lifted off the ground by a cushion of water in between. Technically speaking, aquaplaning happens when water cannot be dispersed quickly enough by the tyres. There are many different reasons for the phenomena to occur. The tyre plays the most important part in how a vehicle drives, and how you control it. A good tyre is measured by the depth of its thread. The grooves or thread on every road tyre have one important role to do. They disperse water so that it can stay in contact with the road. If the thread is not deep, the efficiency of dispersing water also becomes very less. This causes water to build up in front of the tyres faster than it can disperse. Check for the depth of the tyre thread by inserting a small coin between the grooves. Anything below 2mm can multiply the chances of aquaplaning. Damaged tyres should also be changed to newer ones. Faster the speed, more are the chances of you aquaplaning. Even with good tyre surface, if you hit a puddle of water at more than 85 km/h speed, most probably the car will aquaplane out of control. If you hit the same puddle at 40 km/h speed, the tyres will have more time to disperse the water out of the way and the chances of aquaplaning come down remarkably. Most of the roads nowadays have drainage system located at the side of the roads. 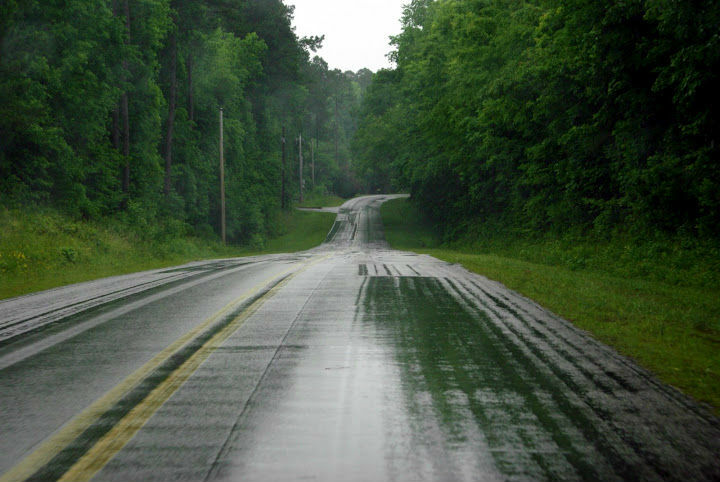 Often it leads to water logs on the side of the road and at times, these puddles may remain hidden because of a curve ahead. This is the perfect recipe for disaster as many cars hit this puddle unknowingly at a very fast speed and goes out of control even before realising. It is always advised to stay at lower speeds while taking corners, especially if it is raining heavily or has rained heavily recently. How can you avoid aquaplaning? 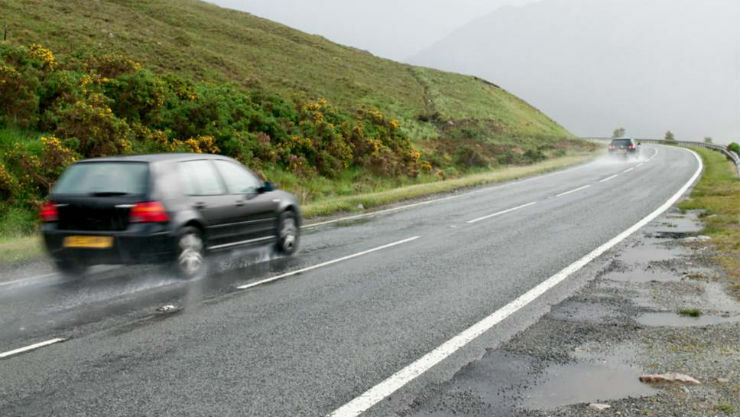 Aquaplaning can be easily avoided by making sure that the tyres have good tread. Even at less than ideal conditions, tyres with good treads can steer you out of aquaplane situations. Make sure that the tyres are properly inflated. Underinflated tyres tend to move inwards after hitting water patch and becomes major cause of aquaplaning. Driving at a slower speed during wet condition is yet another important factor that should be taken into consideration.You should lower your speed to 1/3rd of the normal speed during really wet conditions. The slower you drive, the more time you have to bring the situation under control and as mentioned above, tyres get more time to disperse water if you are driving at slower speed. Disengage cruise control during wet road conditions, that way you will be able to control the speed of the vehicle in case of emergency. Driving in any situation needs the driver to be cautious but if it is raining, pay extra attention to the road. Always, look for puddles and water flow on the road and do your best to avoid them. 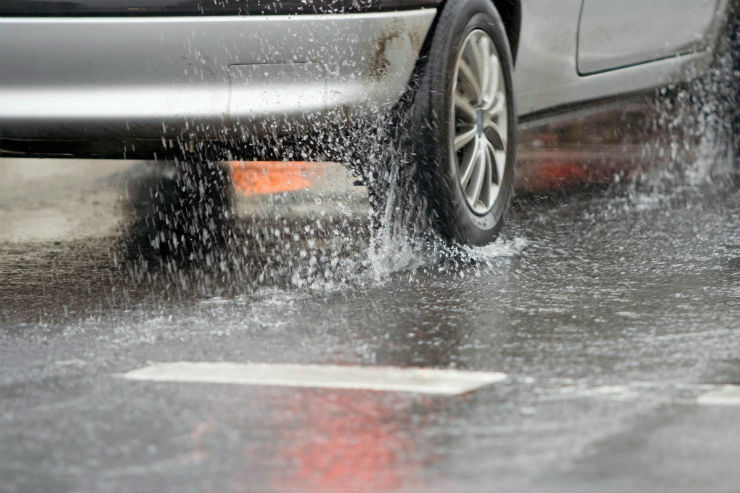 What to do if your car is aquaplaning? Often it is impossible to get to know at the exact point when your car starts to aquaplane. The wheels become free of any traction and hence, the engine revs may rise. It happens so quickly that seldom we see a happy ending after such an episode. If you notice light steering wheel or rear of the car going out of line, don’t do any sudden movements. Staying calm is the key here. The vehicle would not take any feedback during aquaplaning. Do not give in to the temptation of slamming the brakes suddenly, this will send your vehicle into an uncontrollable skid making the situation worse. The steering wheel would not be able to change the direction of the vehicle too. Any sudden movement with the steering can also prove to be extremely chaotic. The best way to tackle aquaplaning is to take off your foot from the throttle and let the car follow its course. When the speed goes down (not by applying brakes), the tyres will start to gain traction again. If you are lucky enough to get your vehicle out of aquaplane, stop on the side, take a deep breath after the unexpected roller-coaster ride and start the journey onwards with more caution.